My eagerly anticipated Black Sixshot finally arrived at my doorstep yesterday. Limited to 10 pieces worldwide when it was released in 2002, this special all-black version of Sixshot was made as a March Lucky Draw prize in Figure King Magazine in Japan. Black Sixshot is a coveted item which has seldom appeared on auction sites such as eBay and Yahoo Japan. In terms of exclusivity, it is definitely comparable to the Clear Version Sixshot, also a March Lucky Draw prize by Hyper Hobby Magazine in Japan. 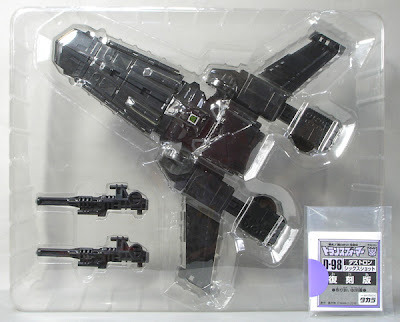 I chanced upon Black Sixshot while I was browsing through the Yahoo Japan auction site, and was immediately tempted to get it. After an intense bidding war among several bidders, I finally managed to secure the piece at the very last minute just as the auction was about to close. Thereafter, it was an anxious wait for the item to be shipped to Singapore, and when it arrived, I practically tore the package apart to reveal the gem inside. It was deja vu once more, as I experienced the same excitement when Shockwave came. Black Sixshot came in its normal reissue box, with no slightest hint of the content within. I have already ordered a custom-made acrylic case to display it in its full glory. Wow! Never have I seen this before. Quite a gem! Lovely piece! Listen, I run a website called www.shmax.com, and the other day somebody contributed a record for this toy. I won't bother begging for photos, but I was wondering if you could confirm that this was originally available from issue #53 of Figure King magazine? A few sites I've been to seem to think it came from Hyper Hobby. Thanks much!